Mizuno Toshikata (1866 - 1908) Thirty-six Elegant Selections: Women of the Bunka Era at Low Tide (Shiohi), 1893. Oban. 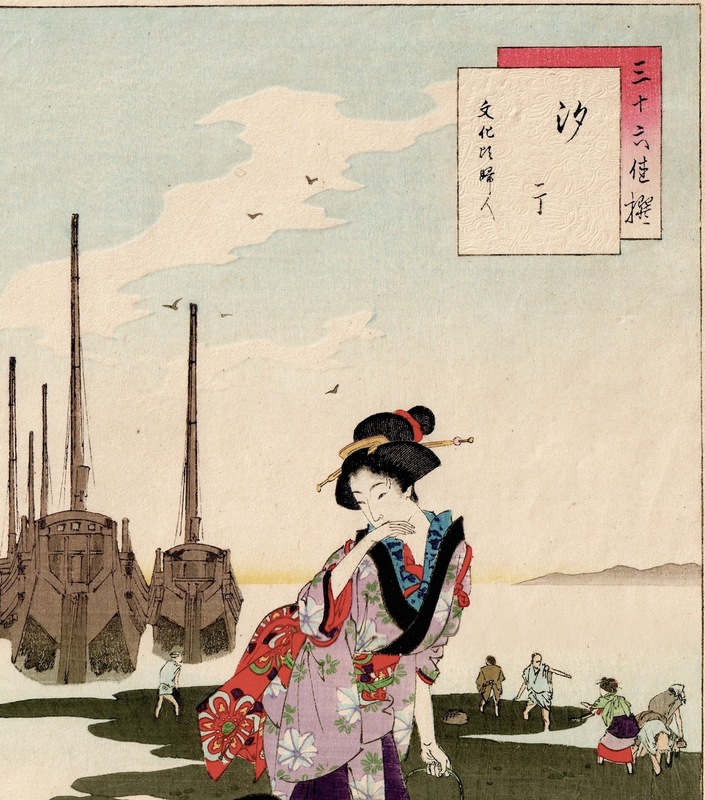 There was a vogue in Meiji, late nineteenth century Japan, not only to celebrate expansionism, military achievement, trade, invention and modernity…. but also to look back with some nostalgia to previous eras. This reflection had also been prevalent in the late Edo, when the focus of the historicism was directed towards male heroes and military rebellion, hence the prevalence of musha-e prints by artists like Kunisada and Kuniyoshi. In the Meiji, most of the significant artists of the day such as Chikanobu, Kunichika, Yoshitoshi and, as here, Toshikata, catalogued women according to the different centuries or historic era from which they imagined they came. Of course, this was a mostly fanciful exercise there being far less in the way of research tools and in any case, those qualities that the artists were looking for had more to do with the aspirations of their own times than the realities of times past. Yoshitoshi produced Thirty-two Aspects of Customs and Manners, and Allusions to the Seven Luminaries, amongst others which catalogue women of different periods… Chikanobu made his finest series, A Mirror of the Ages (Jidai kagami) for the same purpose and here Toshikata has crafted his contribution, Thirty-six Elegant Selections. 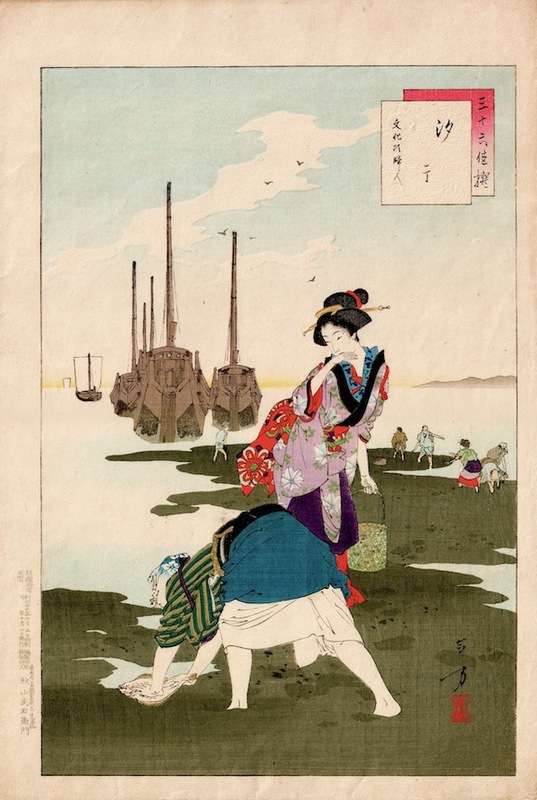 In this piece a woman dressed in the clothes of the Bunka era, observes a fisherwoman scrabbling in the mud at low tide for flat fish. Elegantly drawn vessels occupy the middle distance. A delightful and fabulously produced woodblock print, Embossing is used in both the white cartouche and the fisherwoman's skirt and lacquer has been applied on the geisha's collar and obi of the fisherwoman. One of the most striking compositions in this series. Colour, impression and condition are fine. Full size with full margins.